Allen Perkins Senior founded Perkins Engineering in 1951 after working in Milwaukee, Wisconsin as a design engineer. In 1981, the firm moved from Butler, Wisconsin into a 12,000 square foot facility in Sussex as the first tenant in a newly developing industrial park. Now, Allen Perkins II, PE heads a group of skilled operators, fabricators, technicians, designers and engineers. 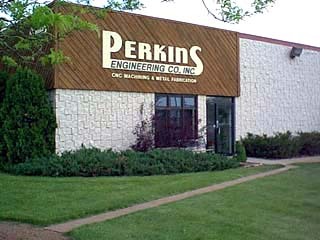 Perkins Engineering provides the expertise you need from designs based on customer ideas to CNC machining and metal fabrication. Perkins is a flexible engineering and machining shop with a diverse mix of skills and equipment that enables us to put it all together for you. From one-of-a-kind prototype items to production manufacturing, timely deliveries and cost effectiveness are as important to Perkins Engineering as they are to you. When it comes to machining, our technical prowess allows us to provide precision parts to your exact specifications. Short or long run, Perkins Engineering has a method to produce your materials at competitive prices. When you need quality workmanship backed by experienced engineers and highly skilled machinists call Perkins. We will supply the know-how when you need it most. Perkins Engineering has one goal, your satisfaction.